The planning that our team does for your child’s menu at school has requirements that are laid out by the USDA and state licensing agencies. 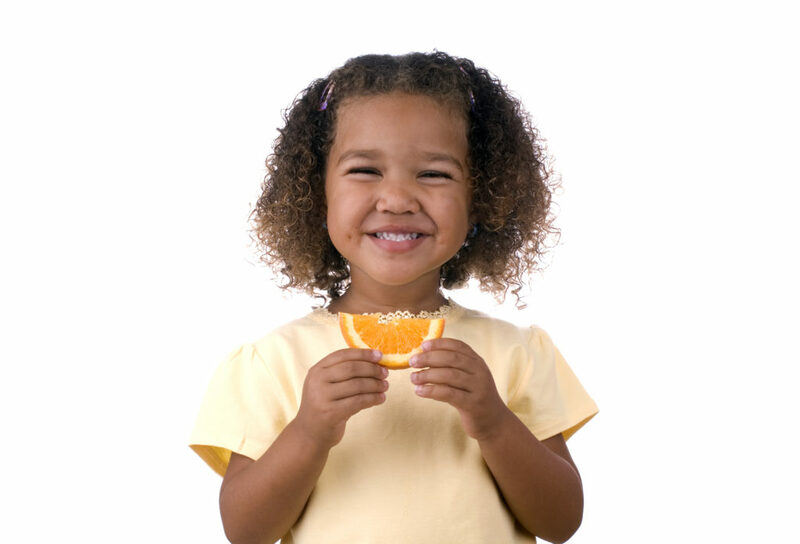 By following the USDA guidelines, we are ensuring your child has foods that provide a variety of vitamins and minerals as well as fiber, while limiting sugar and highly processed foods. Read on to find out WHY and HOW we do this! Why? Eating the “colors of the rainbow” ensures that your child gets a broad range of nutrients. Red contains a number of antioxidants including lycopene that reduces the risk of cancer and heart disease. Orange and yellow are high in carotenoids which the body converts to vitamin A for healthy skin and a strong immune system. White and brown get their color from the antioxidant anthoxanthins which may reduce the risk of cardiovascular disease and arthritis. In addition, the body can’t make or store Vitamin C, so that is sourced daily as well as sources of calcium for children’s bone and teeth growth. Low-fat or fat-free dairy served 1-3 times per day to children under the age of 2 yrs. Whole milk is served 1-3 times per week for 1 yr olds. Why? There are 4 key benefits to eating more fiber. 1. It slows the rate that sugar is absorbed into the bloodstream which helps to regulate your blood glucose levels. 2. Fiber makes your intestines move faster leading to earlier signals of fullness. 3. It cleans your colon, acting like a scrub brush reducing “bad” bacteria and other buildup. 4. Fiber keeps you regular, reducing constipation. A common complaint of many children. Why? Processed doesn’t necessarily mean bad. There is a place in everyone’s diet for minimally processed foods such as bagged spinach or pre-cooked chicken for convenience. However, highly processed foods typically contain hidden sugar, sodium, fat and nitrates. Too much sugar is linked to the development of obesity and elevated blood pressure in children and young adults. With some basic nutrition knowledge, you can put together some great menus, too! Stay tuned for my next article where I share tips and tricks for planning healthy meals at home.